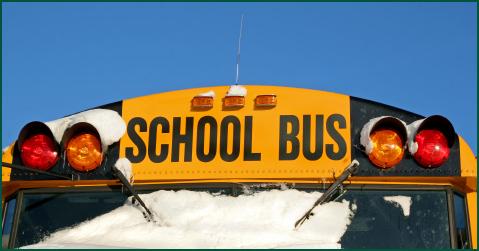 During extreme cold weather or severe weather storm conditions, we recommend that parents remind their children of possible vehicle (bus) breakdown or delays. Parents are advised to exercise their own discretion as to how long a pupil should wait for a school bus in inclement weather. Parents should have a back-up plan in place to allow for unforseen circumstances. If inclement weather prevents buses from doing their morning routes, parents who choose to transport their children to school must be prepared to pick up their children at the end of the school day. Radio announcements will begin no later than 7 am in the event of cancellation of school bus operations and/or closing of schools due to inclement weather. It is the parent’s ultimate decision and responsibility as to whether or not a child should be sent to school during inclement weather. If a bus route or transportation has been cancelled for the morning run, the bus is cancelled for the entire day, unless otherwise notified. Parents will be responsible for the return transportation for any student dropped off at school. The designated bus operators will report before 4:30 a.m. to the Executive Director of the Sudbury Student Services Consortium or Designate. The Executive Director/designate will contact the Directors of Education or designates in order for them to decide on school closures. The Executive Director/designate will inform the media of the transportation and/or school cancellations. Inclement weather conditions sometimes occur after students have arrived at school. A decision to remain in school or to dismiss early will be made in consultation with the Directors of Education. Should a decision be that buses will leave early, the schools will be responsible for contacting parents. The Executive Director of the Sudbury Student Services Consortium or designate will contact the radio stations. In the event of weather conditions in specific areas, Principals may request early dismissal; however approval from Directors is required. The designated bus operators or Principal will report to the Executive Director of the Sudbury Student Services Consortium or designate. inform the City of Greater Sudbury's Director of Transportation Services, who in turn will inform their school crossing guards. On occasion, during extreme cold, student transportation may be delayed or cancelled. Experience has shown that extreme cold (-35°C and colder) presents challenges to diesel vehicle operation which may result in vehicle breakdown. It is one of the Sudbury Student Services Consortium's priorities to mitigate the effects of cold weather operations. School bus operators are expected to take the necessary measures to ensure vehicle reliability. Elevation differences between the airport, the city and outlining areas can result in up to 10°C lower temperatures from what is observed at the airport. Caution is exercised by the Executive Director on mornings when the Sudbury Airport temperature approaches -35°C. At this temperature the potential exists for major delays due to fuel clogging filters and loss of engine power. On these specific days, the Executive Director shall follow the Inclement Weather Procedure. The decision to only cancel morning transportation could also be considered should significant change of temperature occur during the day. A storm pamphlet containing information for parents for inclimate weather is available here. Questions and answers for parents regarding inclimate weather is available here.